The United Muslim Christian Forum (UMCF) is elated to announce its upcoming International Interfaith Conference which will be held later this year in New York or Washington, DC. UMCF founding member, the Honorable Khalifa Hussein Adams, along with board members Rev. Arthur Suggs and Dr. Diane O’Heron are extending invitations to world leaders, foreign ambassadors, elected government officials, representatives of the US State Department, various government agencies, interfaith leaders, grass root community activists and members of the press. 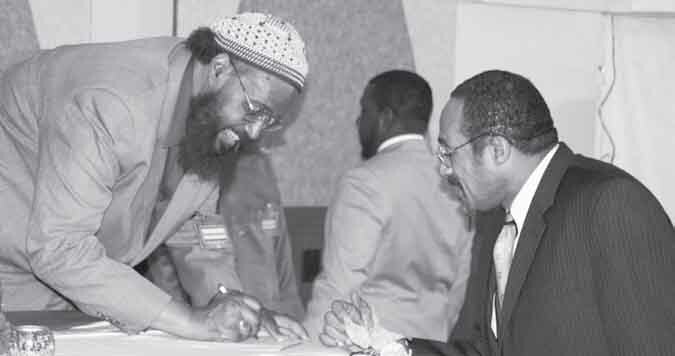 UMCF founding member, the Honorable Khalifa Hussein Adams, along with board members Rev. Arthur Suggs and Dr. Diane O’Heron are extending invitations to world leaders, foreign ambassadors, elected government officials, representatives of the US State Department, various government agencies, interfaith leaders, grass root community activists and members of the press. To help insure the success of this most essential gathering, UMCF is encouraging other organizations to become sponsors and join the planning committee to share ideas and offer support. This conference and its distinguished attendees will focus on those who make up over half the world’s population- Muslims and Christians. The state of the world today underscores the need for this summit, as there is no government that can bring peace to the world and save this great country, the United States of America, from a clash between two civilizations, Islam and Christianity, without the essential element of Muslim Christian unity. America is a unique country where no one people or group can claim to have solely built it. The citizens of this nation drafted and established the laws of the constitution, by which this great nation is governed and all its citizens’ rights guaranteed. Hence, the UMCF cannot sit idly by without challenging those provocateurs who advocate a clash between these two great religions. Muslims and Christians must work together to benefit all of humanity by working diligently together to stop this unholy war called terrorism. We must let the world recognize that Islam is the religion of peace, both Muslims and Christians share a belief in One Almighty God, share a profound love of Jesus son of the chaste Mary and accept the original Gospel as the word of the One Almighty Creator. With so many similarities in the foundation of belief – why the differences? UMCF will be delivering formal invitations along with the complete conference itinerary in the near future. Interested parties may visit our website for more information (www.UMCForum.org) or contact the UMCF Public Relations Director, Muhammad Hasib Qadri by telephone (607) 348-5979 or via email (info@umcforum.org). (Left) UMCF Spokesman, Muhammad Hasib A. Haqq, converses with a guest during the December 2009 UMCF celebration of the life of Jesus son of Mary.